This week was cold - no way were we going to sit out in the sun for lunch! We went to Manosque for our weekly date with Provençal cuisine and installed ourselves at Le Gavroche, just outside of the Old Town section. Le Gavroche means "The Newspaper Boy," so perhaps someone sold papers in front of this spot for many years? It's clearly a very popular lunchtime choice, and was quite busy, filling up completely about ten minutes after we arrived. 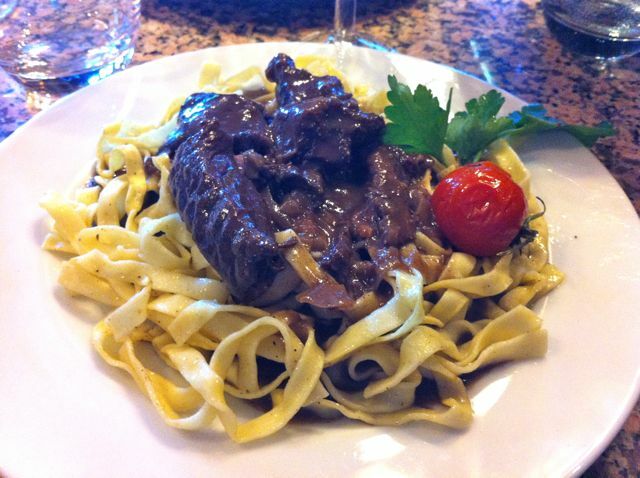 The À la Carte choices were expensive enough, so we both opted for the Plat du Jour at €9.00, mostly because it was Daube de Boeuf, which we hadn't had for ages. Daube de Boeuf is a rich, hearty beef stew, made with marinated cubes of beef and usually left to sit overnight to allow the flavours to develop. The version served in Le Gavroche was very rich and tasty, with plenty of big, tender chunks of beef, but it was a little lacking in vegetable matter - I've seen it made with plenty of carrot, onion, celery and black olives for added flavour. Traditionally it's served with Camargue rice, and I think it would be good with mashed potato too, but it was served with pasta here. I think I was a little unlucky - some bits of the pasta on my plate were hard, as if they had dried out while being kept warm. The LSH said his was fine - I wondered if they had almost run out of pasta and had to cook extra, leaving me with the stuff that had been sitting there. It was also a little slow to arrive, which would give some weight to that theory. This restaurant had Café Gourmand on the dessert menu. 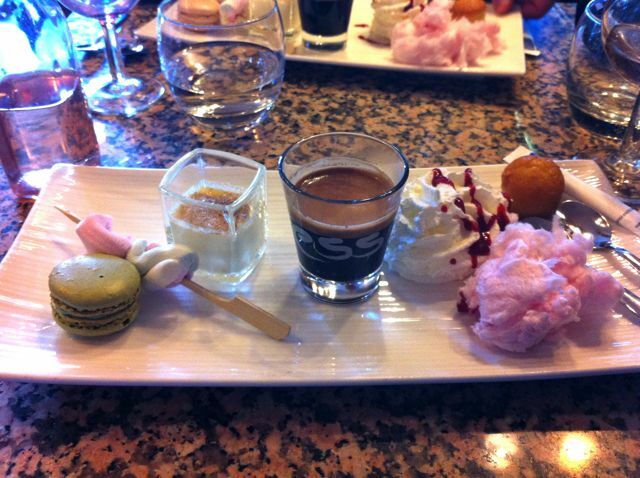 Café Gourmand is a recent discovery of ours. You get a cup of coffee - one of those tiny, strong French coffees - sitting on a wide plate which has several mini desserts on it, so you get your coffee and you get to sample a few different desserts. It varies from restaurant to restaurant, but we both felt the need for something sugary - our Sweet Tooth still needs to be pandered to after the excesses of Christmas! So what are all these little bits and pieces on the plate? Starting from the left, we have a mini Macaron, which was excellent, although it probably came out of a packet. Next to that was...um... two marshmallow sweets, one pink, one white, threaded through a skewer. Eh? Someone is taking Artistic License a little far here, I think! To the right of that is a tiny pot of Creme Caramel, (which was lovely) and next to that we have the cup of coffee (black). Moving on from the coffee is a big blob of chantilly cream with a bit of syrup dribbled over it, and to the right of that, at the back of the plate, is a very tiny muffin, which definitely came out of a packet. The large pink mass in the foreground on the right is Candy Floss - as if there wasn't already enough sugar on the plate! This was the strangest Café Gourmand I've had to date, but to be honest I absolutely love candy floss and hadn't had it for years... it worked for me, although I could have lived without the marshmallow sweets! Sweet Tooth very much satisfied, we finished up and paid. Total cost for the meal was €14.50 each - a little expensive, I think, given that the food did not quite come up to standard. I do enjoy reading about your lunch outings. Having moved here from NYC and worked in the restaurant industry for many years, the cuisine in the hinterlands is usually lacking, both in quality and access - restaurants only serving seasonally. One exception is fresh out of the water seafood. I quite like the notion of seasonal food. It is is very prevalent here - winter squashes, leaf beets, winter greens and leeks are all in season at the moment and are very much to the fore, last weeks pumpkin soup being a case in point. Winter warming food is good when it's cold! Oh - I like seasonal as well! Making some lentil vegetable soup as we speak. AH! THAT kind of seasonal!! Yeah I would prefer a local restaurant that's open all year round too, but they've got to make a living I suppose! Everything seems delicious except the hard pasta and marshmallows for me. How nice to go out each week for lunch. We should all try and do that.